For 3 million years, this beautiful smudge of gas has been bursting with new stars. Just under 10,000 light years away in the constellation of Cassiopeia, NGC 281 is busy with everything from brand-new baby stars to active X-ray sources to the lingering traces of a supernova. NGC 281 is 9,200 light years away in the direction of the constellation Cassiopeia. It is located almost 1,000 light years above the galactic plain of the Milky Way, making it unusually easy for us to observe. Nicknamed the Packman Nebula due to the gaping mouth in optical light, the distinctive shape is muddled when observing NGC 281 in other wavelengths. Behold the Pacman Nebula—now with teeth! The composite image is optical light (red, orange, and yellow) imaged by the Kitt Peak National Observatory near Tucson, Arizona layered with X-ray data (purple) captured by the Chandra X-ray Observatory. This multi-wavelength exploration of the nebula highlights the over 300 individual X-ray sources illuminating star-forming region. 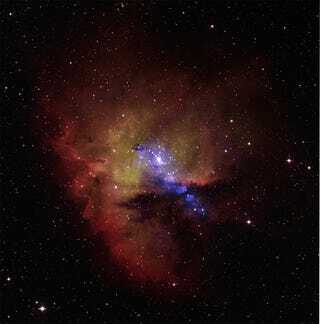 The X-ray sources are mostly clumped in the central cluster, IC 1590, pumping energy into the cloud gas and dust. The illumination stretches out towards NGC 281 West, lighting up clouds of hydrocarbons, magnesium, sulfur, and silicon, elements indicative of a supernova in the not-so-distant past. When observing the nebula in wavelengths outside the optical range, the nebula looks stunning while loosing all resemblance to its Pacman namesake. This is a composite image of the same nebula, zoomed in, with layers of X-ray (purple) and infrared (red, green, blue) data from the Chandra Space Observatory and the Spitzer Space Telescope. Seen in the X-ray and infrared spectrum, the temperature differential imposed by the intense radiation of high mass stars becomes more apparent. Here, the gas and dust is boiled away by powerful winds clearing lanes, condensing the nebulous twists into dense columns. This is a process of creation nested in destruction: by driving the dust into dense distributions, star formation becomes possible.